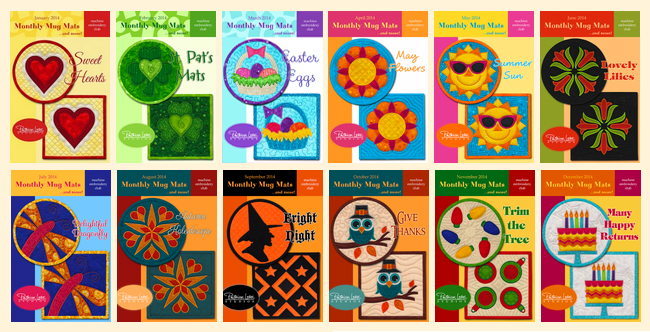 - All of the designs from our 2014 Monthly Mug Mats Club are now available as a complete collection. Immediate download upon checkout. May also be purchased on flash drive, here. - More than 50% off the individual retail prices of the designs. 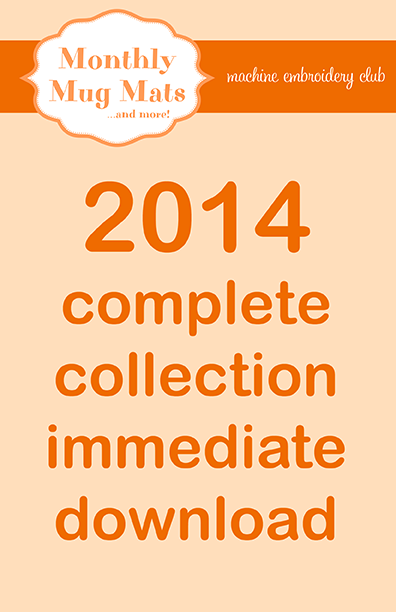 - 12 months of designs originally offered January-December 2014. Your files be delivered to the email address provided to us by PayPal upon checkout. 1. You must download and safe your files to backup storage within 7 days from purchase. 2. You must have a large hoop to be able to stitch and quilt these designs in the hoop. The round mats are 7.75" diameter and the square ones are 7.75 x 7.75". We do not give refunds on digital products. 3. You must have a knowledge of how to download and use the digitized embroidery files in your machine. You will download the files to an external drive and will not try to open them with anything other than your embroidery software or machine. We're happy to help if you have problem, but this is a simple process and if you have problems or questions you may also need to contact your machine dealer. We're happy to offer tips on how we embroider but we do not offer instruction with the designs and, again, your machine dealer is usually the best source for this. You will find helpful photo and video tutorials on how we make out mats on the download page. 4. We do not give refunds for digital products. Our customers agree that we have some of the best digitizing in the industry for Patrick's machine embroidery applique designs. Of course, if there's a problem with a specific file, we will offer an additional download or otherwise get the month's designs to you. If you've made some of our mini mats before, you know you're going to love these and we hope you will tell your friends who may not be familiar with our embroideries. 5. You have read and understand the copyright statement, below. You will not "share" the embroidery files with anyone nor will you offer the designs for sale. You will not sell finished products made using Patrick's designs without requesting permission to do so. Patrick is very generous with this permission but it is important that we know ahead of time instead of finding out online or from agents. 6. You should add our email addresses to your contacts list to ensure that you receive our emails and that they are not sent to your SPAM folder. Please add: gary@patricklose.com and info@patricklose.com. 7. To contact us, please write gary@patricklose.com or call Patrick Lose Studios at 623-414-9464. Facebook cannot be used to resolve customer service issues.